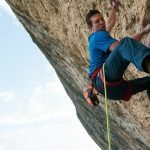 This new low-top shoe feels and climbs much more like a boot than a precision climbing shoe, and I think that is a good thing for those who are more interested in doing long moderate trad climbs in the mountains. This is a comfortable shoe that could be worn all day. It's a fantastic edging and smearing shoe, but struggles on pockets and thin finger cracks. Plan to size big. The Five Ten Anasazi Guide is a great edging shoe thanks to its stiff sole, and there is enough room in the toe box to comfortably curl your toes down onto tiny holds. The Guide flexes enough to press your foot into smears and blank patches of rock and provide confidence that your foot will stick. A high-profile toe box makes using pockets difficult. This shoe has a lower volume heel than other Five Ten shoes, and fit really well, making heel hooks feel solid. I could climb a couple thousand feet of hand cracks in these shoes before I╒d have to take them off, but finger cracks are a different story. A large profile toe box made the thin and steep stuff really challenging. The Guide offers all day comfort, thanks to a lined leather upper and a nice roomy toe box. I wish the shoe had a slightly higher arch to remove the air pocket under foot, and provide more support for all-day routes. 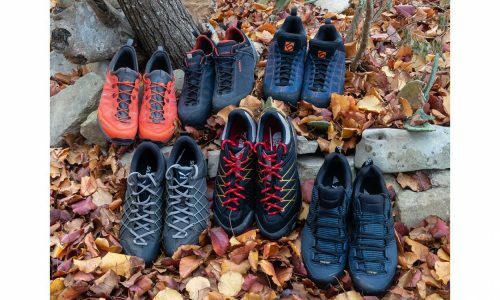 Overall, the Five Ten Anasazi Guide is a well-made, long-lasting shoe at a reasonable price.